Born in Philadelphia, where he grew up idolizing Athletics manager Connie Mack, McCarthy is among a handful of successful major league managers who never played in the majors. After attending Niagara University in 1905 and 1906 on a baseball scholarship, he spent the next 15 years in the minor leagues, primarily as a second baseman with the Toledo Mud Hens, Buffalo Bisons, and Louisville Colonels. In 1916 he signed with the Brooklyn Tip-Tops of the Federal League—then considered a third major league—but the league folded before he could play a game with them. Joe McCarthy (left) with Bill Terry of the New York Giants at the 1937 All-Star Game. McCarthy briefly served as player-manager in Wilkes-Barre in 1913. He resumed his managing career with Louisville in 1919, leading the team to American Association pennants in 1921 and 1925 before being hired to manage the Chicago Cubs for the 1926 season. He turned the club around, guiding them to the 1929 NL title, but was fired near the end of the 1930 season. He wasn't unemployed for long, however; the Yankees hired him in 1931. 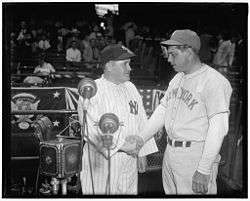 With the Yankees, his strict but fair managing style helped to solidify the team's place as the dominant franchise in baseball, winning a World Series in 1932. His most successful period came from 1936 to 1943. During that time, they won seven out of a possible eight pennants, all by nine games or more, and won six World Series—including four in a row from 1936 to 1939. They were the first American League team, and the third in major league history, to win four straight pennants, and the first to win more than two World Series in a row. The only time during this stretch that the Yankees' dominance was even threatened was in 1940, when they struggled all season and finished third. McCarthy resigned in May 1946, partially due to conflict with new owner Larry MacPhail. McCarthy returned as manager of the Boston Red Sox from 1948 to June 1950, but was unable to capture a pennant despite reaching a one-game playoff with the Cleveland Indians in 1948. 1 2 3 4 5 6 7 "Joe McCarthy". Baseball Reference. Sports Reference LLC. Retrieved December 5, 2014. 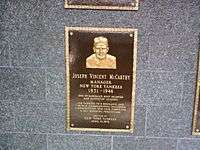 1 2 3 4 "McCarthy, Joe | Baseball Hall of Fame". Baseballhall.org. January 13, 1978. Retrieved 2012-07-16. ↑ "New York Yankees Managers". Baseball Reference. Sports Reference LLC. Retrieved December 5, 2014. ↑ McMurray, John. "Joe McCarthy". Society for American Baseball Research. Retrieved 2012-04-22. ↑ "This Morning With Shirley Povich: Iron Horse' Breaks as Athletic Greats Meet in His Honor". Washingtonpost.com. July 24, 1998. Retrieved 2012-07-16. ↑ . "Joe McCarthy". SABR. Retrieved 2012-07-16. ↑ "What's In A Number? | River Avenue Blues". Riveraveblues.com. Retrieved 2012-07-16. ↑ "Marse – Definition and More from the Free Merriam-Webster Dictionary". Merriam-webster.com. August 13, 2010. Retrieved 2012-07-16. ↑ "Manager of the Year Award by The Sporting News on Baseball Almanac". Baseball-almanac.com. Retrieved 2012-07-16. ↑ "ESPN.com: MLB – All-Century Team final voting". Static.espn.go.com. July 18, 2003. Retrieved 2012-07-16. ↑ "Torre belongs in Monument Park | yankees.com: News". Newyork.yankees.mlb.com. Retrieved 2012-07-16. ↑ "Buffalo Baseball Hall of Fame". Retrieved August 29, 2012. ↑ "Joe McCarthy". Baseball-statistics.com. Retrieved 2012-07-16. ↑ "Joseph Vincent "Marse Joe" McCarthy (1887–1978) – Find a Grave Memorial". Findagrave.com. Retrieved 2012-07-16. ↑ "Joe McCarthy's Ten Commandments for Success : A Legendary List on Baseball Almanac". Baseball-almanac.com. Retrieved 2012-07-16.